The journeys are new directions travelled, on my lonely chair, in the search for improving musical composition and recording quality techniques. 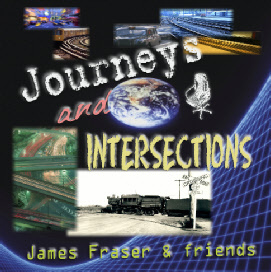 The intersections are collaborations with other musicians along the way. This is my second collection of songs recorded, this time, between 2008 and 2010. In my first collection, Songs From a Lonely Chair, all were completely my own work. This new collection includes a number of collaborations with other musicians over the internet. One of the greatest things about the world wide web is that we can share our musicianship with people from anywhere in the world. Over the past four years I have been lucky enough to work with people in USA, Canada, Greece, France, Germany, Belgium and of course here in the UK but without actually meeting them.